With such a disappointing and uneventful winter last year in regards to weather, ski and snowboarders are eager to get on the slopes this year. A successful day on the slopes is often determined by several unpredictable factors that can frustrate snow bunnies and bears during the winter season. Not all of us have the luxury of vacationing in Aspen or Vail, so more often than not; we are left chasing the perfect conditions. Instead of madly stalking the weather report or making the unnecessary trek up the icy mountain, here are a few apps to help you find the perfect ride. Who better to trust for snow and ski conditions than outdoor retail outfitter, REI. 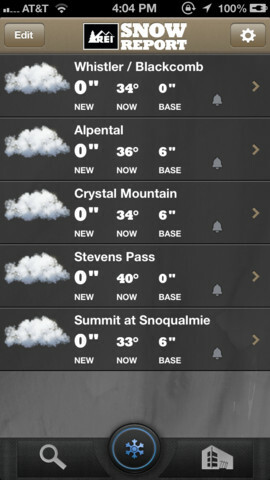 With the app, users can fill their “Favorite List” with ski and snowboarding resorts throughout the world. Living on the East Coast, but wonder what’s happening on the slopes in Vail? Users can get real-time weather condition reports, including temperature and snowfall, from resorts saved on their “favorite list.” Users can even get push notifications when new conditions arise, such as trail openings, snowfall over the last 72 hours and depth. Instead of fiddling your frozen fingers to call a friend on the slopes, share your location and conditions with friends on Facebook, Twitter, E-Mail, SMS, or the app’s messaging board. What’s more? Find resort trail maps and cameras with the app, and keep in touch with what’s happening at nearby resorts with the app’s Twitter feed. The app even boasts a REI store locator in case someone in your camp forgot a piece of gear or needs to rent equipment. Next time you find yourself day dreaming about fresh powder and warm chili, take out your trust-worthy REI Snow Report app and get going! Imagine the best ride of your life in the most perfect conditions, only to realize at the end of your fantastic run that you are indeed lost. 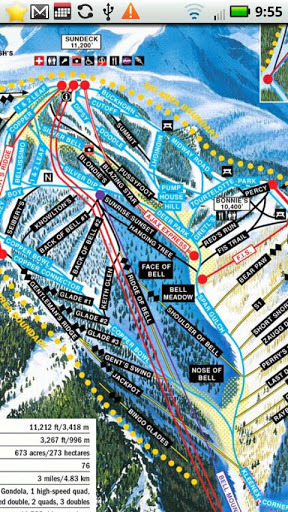 We all can attest to how annoying and un-cool it is to whip out a paper trail map on the slopes. Keep your cool and your sanity, with iTrailMap 3D. This app leaves no paper trail, allowing users to download paper maps onto their iPod touch or iPhone without a Wi-Fi or cellular connection. With GPS tracking and user-friendly 3D maps, ski and snowboarders can record trail-runs and distance travelled. Users can even record their trails and upload them to Google Earth for later use. Users can pan, zoom, and rotate 3D maps for a more detailed look, or flip easily from 3D maps to paper maps, with a single touch, for convenient, time- saving use. If you think that’s impressive, iTrailMap also provides users with 3D resort apps that are tailored to specific mountains like Aspen Mountain, Vail and the SkiWelt Resort. These specific apps incorporate all the benefits of the iTrailMap technology along with additional information such as snow conditions, cameras and trail and lift openings. Save your fingers and time with this easy-to-use ski and snowboard app. Assuming that not everyone in your group of friends or family is an expert skier or snowboarder, chances are members of your group are going to be dispersed on different trails and runs. Some may find solace on the bunny hill, while others try their fate on a black diamond trail. To avoid making multiple phone calls while on the slopes or setting a tentative time to meet, use the Find My Friends app. 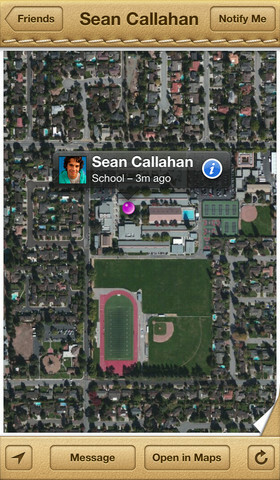 With the Find My Friends app, users are able to locate a friend or family member easily. Similar to Facebook, once you install the Find My Friend app on your mobile device, send a request to whomever you wish to locate. After the individual accepts the request, the user can then locate their whereabouts. The temporary sharing option allows users to share their location with individual friends or family members or a group for a limited time. For example, for a two-hour period on the slopes, share your location with friends in case they want to meet you in a certain location. The app also boasts location-based alerts, ideal for parental check-ins. Planning a winter vacation or a day on the slopes can be hard, so why not make it easy with these fun easy-to-use apps? Be sure to tune in next week for more Apps on Tap!